Environmental print is in the world all around us; street signs, candy wrappers, cereal boxes, shopping signs. 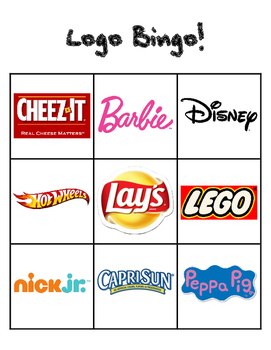 Using these familiar logos is a great way to practice the beginning stages of literacy development with your emerging reader. Consider all the information your little one can learn from them. Colors, letters, numbers, and shapes all pop to mind. Most adults don’t consider environmental print actual reading, but think again. When it comes to helping young children learn about the written word why not take advantage of the numerous opportunities that are all around. Help your child engage with the print they see in the store by helping them read the logos of products as you shop or help them look for words that start with the first letter in their name while you are at the grocery store. As your child engages in reading and recognizing environmental print, he is gaining alphabet awareness, learning the differences between letters and words, letter recognition, letter/sound knowledge, and motivation to read. As children interact with familiar print they gain success and confidence in their reading ability. The more children interact with the written language, the larger their data base of background knowledge will grow for beginning reading skills. How can I use environmental print to help my child learn to read? Read on for interactive ways to help engage your child in reading environmental print. • How many times can you find the letter ___? • Can you find a word that starts/ends with the letter ___? • What shapes can you find? • Look for the color ___. • Can you find any words you know? Point to it and read it to your Mommy. • What numbers can you find? Try playing “Memory” with this free printable from Paige Davis at Teachers Pay Teacher. Print them out on cardstock and cut them apart and you have yourself a quick and easy game to play with your little reader. Click here to access this free Environmental Print. Beginning Sound – ask your kiddo to put all the wrappers that start with the sound /s/ in one pile and all the wrappers that start with the sound /m/ in another pile. I found this cute little Logo Bingo set on TPT by The PreK Lady. It’s not free but it is super cute and at only $2.00 it won’t break the bank. Click here to access the link to this printable Logo Bingo. Create a poster board of Environmental Print by collecting wrappers, labels, and logos of all sorts. Then, cut out the Environmental Print and glue it to a poster board. Now you are ready to play! 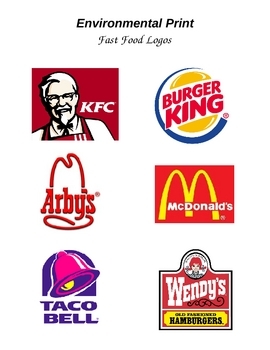 “I spy with my little eye something that starts with the sound /p/… says Burger King… ends with the letter L. You get the idea. Remember all those cereal boxes you collected? Use some of them to cut up and turn into puzzles. Your little one will have fun piecing them back together. Read, read, read anything and everything starting when children are very young. Young children are very curious about the print they see around them. Take the time to encourage that curiosity so they may become life long readers. You are right. Children are very curious about the print around them. This is such a natural place to start them on their reading journey!